All of you who wish to be on time for the events are recommended to arrive well ahead of the scheduled event times. Large amounts of people arriving for the World Cup events decrease the capacity of the access roads compared to regular road conditions. At the same time you need to counts on shuttle buses which will use the same road system to transport spectators from more distant parking ground. On top there will also be fan buses, team cars, media and VIP cars as well as supply and organizational truck. For the reasons mentioned traffic jams may occur, especially when close to the start of the event. 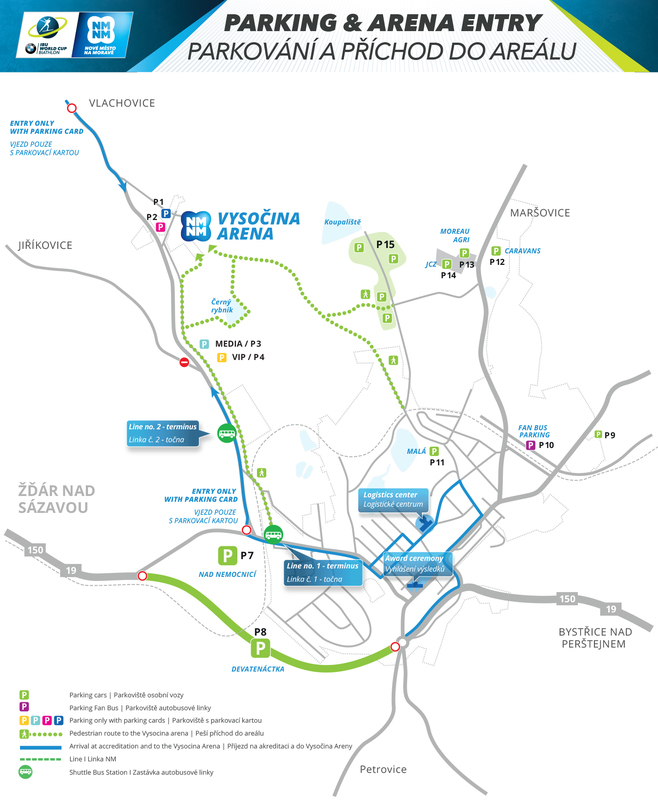 All parking areas are within walking distance of the WC stadium (Vysočina Arena). Fans arriving at the World Cup with one of the tourist agencies or in organized groups may use a special parking area signed FAN BUS. The area is located on the walking distance on the Nezvalova Street at the Nové Město na Moravě railway station. Those of you invited by organizers to follow the World Cup events in person shall first visit the accreditation office at the Logistic centre inside the Cultural house Nové Město na Moravě. Here you will collect your accreditation and parking cards giving you permission to park your car in the close proximity of the Vysočina arena – at the Vlachovická street. In case of favorable weather a grassed area above the hospital in the Nove Mesto na Morave, ul. Žďárská will be used for parking (P7). Digital traffic panels will guide you to the area. This parking option, however, will only be confirmed under favourable weather conditions close to the competition days.